Back to school time is upon us, and the September meeting is right around the corner! Please note that we will be meeting at the Pittsburgh Project on Sunday, September 13th due to the Labor Day holiday. The skillbuilder this month is Alternate Grids with Sally. We will explore alternate grids to make a table runner or a small quilt (or larger if you want)! Prepare 10 or more blocks of varying sizes but no larger than 7” square. If they end up larger – which happened to me- we can make adjustments. This is a great opportunity to use up your scraps and orphaned blocks. I made improv nested squares but you may use any block. You can check out June’s block of the month for inspiration. There is a link to 42 possibilities. Bring at least 1 yard of a solid fabric for sashing that will show off your blocks. If you want something larger than a table runner then bring a larger piece of solid. Don't forget your machine, cutting board, rotary cutter and the usual supplies. Make sure that you bring an extension cord. 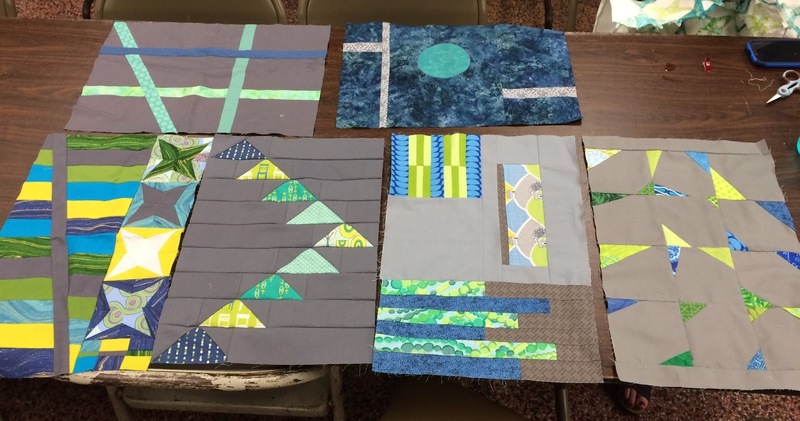 Sarah is still collecting 12x18" blocks in grey/greens/blues for the Pittsburgh Project charity quilt. Please consider donating one at the meeting! Our BOM for September is Flying Geese. This is a great block for using as filler when doing alternate grids. Check out this website for four different methods of piecing your geese. Some reminders: if you have not paid your dues for this year, please bring your payment to the meeting. Dues can also be paid by PayPal now. See the "About Us" page on this website for the link to do so. Also, space is filling up for the Sherri Lynn Wood workshop. Don't forget to register! All of the details are available here. Fyi, the Beaver Valley Quilt Show is coming up soon! Entries are due by September 7th. The theme this year is Paper Piecing. You can find all the details on their website. Let us know if you are entering so we can keep an eye out for your work! You can now pay your dues via PayPal! Our entry for the QuiltCon charity quilt challenge will be an improv pieced quilt based on one of the iconic area bridges. Bundles will be dispersed at the September meeting consisting of fabric and images to use for inspiration to improv piece your portion of the bridge. Amanda has arranged space for a sew-in at Quilt Company on Saturday, October 17th from 12:00-4:30. This is an opportunity for us to work on the blocks together and get any assistance that anyone may want. Please email Amanda if you want to participate but cannot make it to the September meeting to pick up a bundle, and she will make arrangements to get one to you. Completed blocks are due at the November 1st meeting. 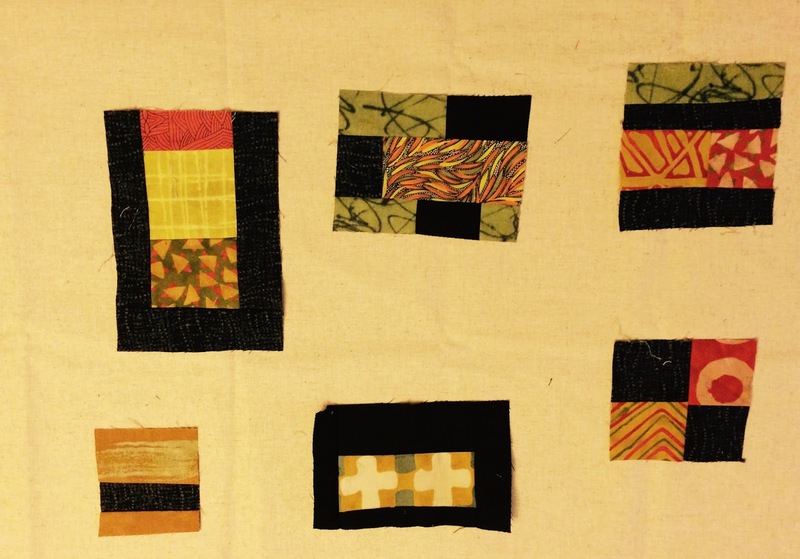 Gerri showed blocks that she has completed from Elizabeth Hartman’s “Patchwork City”. She is continuing a project that she started with her friend Pat who has since passed away. These blocks are amazing, Gerri! She is also working on blocks for her own version from the book. 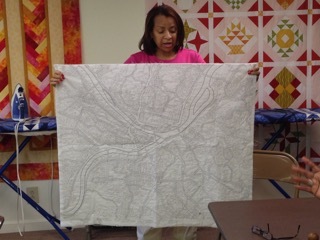 Stephanie displayed this amazing hand quilted map of Pittsburgh! 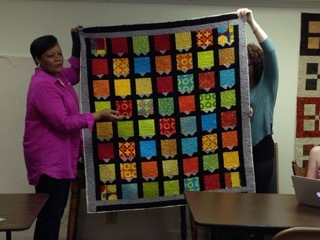 Vivian had some colorful quilts, including this one which includes a clever use of prairie points! 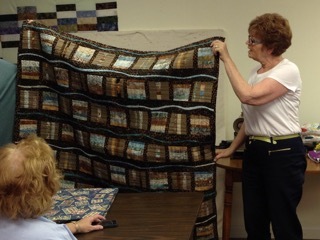 Jan showed us the second quilt that she had ever made. She must be very adventurous as she even included curves, spliced in!! 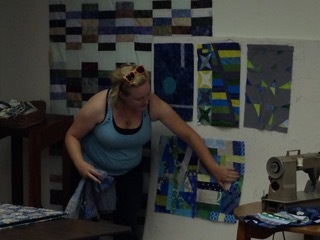 Sarah showed the blocks that she has collected for the quilt that we will be donating to the Pittsburgh Project’s annual fundraising auction. Anyone who has completed a block and has not already given it to Sarah, please get it to her at the September meeting. To view all of the photos from this meeting please go to the guild's Flickr page. There was a lot of good stuff! PgHMQG members also contributed about a dozen pillowcases to Quilter’s Corner August pillowcase drive for pediatric cancer patients at Children’s Hospital. What a great cause! Thank you to everybody who participated! The group was then treated to a very humorous presentation by Maureen with additions from Mary Beth and technical assistance from Lizzie. There were many photographs of booths from Spring Quilt Market at Minneapolis. Quilt Market is where the shop owners go to find all the latest fabric, books, and projects being released in the upcoming year - a giant quilt shop!! Talk about stimulation overload. They showed us some of the vendor display areas, and told us many funny stories about some of the top designers. They said that current trends are not changing much, maybe some plaids, more solids, and more modern prints (yay!). They particularly liked the booths by Anna Maria Horner and Michael Miller. Maureen especially like Jessica Darling’s bag designs and really bonded with her! Quilter’s Corner may have a visit from her yet! Maureen showed some of her projects. “Plus” signs are hot right now, so she showed a quilt that she had made with a simplified “plus” sign. She also has been making blocks from “Patchwork City”. They were great! We were then treated to cookies and pastries. Of course the biggest treat was to get some shopping in upstairs. We all managed to find more than a few fabulous fabrics to purchase. Thank you again to our generous hostesses, and hopefully we will meet again soon at their great shop and meeting space! The next meeting will be September 13th at our normal location, the Pittsburgh Project. Please note that this is the second Sunday in September due to the Labor Day holiday. Sally will lead us in alternate grids. Look for more details available soon. Details will be up on the site soon regarding registration for the Sherri Lynn Wood workshop October 4th at the Pittsburgh Project. Remember, members will have the first opportunity to sign up, but act fast as space is limited. PghMQG is now on Instagram!